The sentimental insider is no longer among us. His legacy, however, weighs on my mind. Egypt is changing rapidly and radically. Over the past decade, the number of democratic nations in Africa and elsewhere has dramatically increased. The spread of electoral democracy in much of Africa south of the Sahara has been accentuated with the end of apartheid in South Africa. It was during the end of apartheid in South Africa that the Weekly was born with Hosny at the helm. His style of leadership disrupted many comfortable assumptions. He was a great believer in the superiority of liberal democracy as a political system. Yet, he was of a generation that instinctively felt that certain overbearing aspects of government in Egypt and the Arab world were bound to survive the wave of liberalisation then sweeping Africa, South America and Eastern Europe. Egypt was then knocking at the door of the “knowledge economy” that profoundly influenced the make-up of the media in the 1990s. Hosny understood that past ways of doing things were becoming anachronistic and doomed to failure. However, he was cautious about embracing the brave new world offered by the information revolution. Perhaps he reasoned that Egypt’s full integration into the world of the knowledge economy would come sometime later, when he was no longer in charge. He wanted to leave something behind him that had both substance and sustainability, something that his hand-picked staff could build upon and improve. He was an accomplished master at working in the system he was raised in. The question facing Egypt and the Arab world over the next generation would be how to emulate the most positive experiences of democratisation in the developing nations that had undergone fundamental changes. It was a question that Hosny shrewdly preferred to avoid, though he left the door ajar for reform to move in gradually. Yet, the Weekly ‘s first editor-in-chief treated this chain of events — democratisation and the onset of the knowledge economy and the information revolution — as more than just a happy coincidence. He foresaw the ripple effects of such developments, and he realised that a considerable part of the enthusiasm shown by his young staff for this new English-language publication was a widespread desire for greater democracy and freedom. Times were changing, but not quickly enough. Hosny may have felt that he would not be there when the pace of change really quickened. Some staff members began to ask how far they could go in expressing their opinions in what was, after all, a national paper. His answers were often non-committal, though always principled. He set the parameters, but left details to conjecture. As head of the Weekly ‘s foreign desk, I understood that I perhaps had more room to manoeuvre than others. Hosny was not unconcerned by the judgment of later generations, and he was not unaware that impatience among the staff would probably echo in negative verdicts on his policy decisions. However, he knew that he could not take a relaxed attitude to questions touching on national security and the national interest. His measured answers could prove frustratingly elusive. He had nothing against the free flow of ideas. He was, however, acutely conscious of the non-democratic pressures that could sometimes hinder people in his profession. The new focus on democracy and human rights led to challenges, and those challenges were, and are, substantial. This was not necessarily a bad thing: Hosny knew that workers in the media could not afford simply to sit tight in the hope of securing a more favourable working environment. Any prospective journalist in the age of the information revolution would need to have formidable knowledge of state-of-the-art technologies. He or she would need to master the increasingly complex tools of the trade, and also to address any shortcomings in the working environment. The greatest challenge facing those Hosny left behind was to continue to produce, on a weekly basis, a newspaper that would live up to readers’ expectations as the country’s leading English- language publication. The past seven years without Hosny have been sometimes laborious and lean, but those he left behind him soldier on. Seven years on, it is difficult to fathom what Hosny would have made of the gigantic strides Egypt has taken in democratisation and the enhancement of personal freedoms. Yes, he would have been the first to note that the country still has some way to go. But it is also likely that he would not have spelt out his beliefs into print. In fact, he rarely wrote, except on very special occasions. Now that Ramadan is upon us, Hosny, a Coptic Christian, would undoubtedly have insisted that a giant Ramadan lantern be installed in the Weekly ‘s offices. He was unequivocal in his insistence on the significance of Muslim- Christian solidarity as Egypt moved towards a more democratic dispensation. Ramadan he saw as a moment of triumph for inter-faith solidarity, though he might not have said so in his articles, whether in the Weekly or elsewhere. Hosny had no time for the sometimes expressed grievances over the political and social inequality between Christians and Muslims in Egypt. Economic inequalities, discrepancies in living standards, and glaring differentials in income between rich and poor were for him more serious social divides. He was mindful that Egypt was passing into a perhaps more precarious political age and he characteristically treaded gently. The 1990s exposed a deep well of resentment over inequalities in economic power, and, for a majority of people, affluence is nowhere to be found. It is true that at one point in the paper’s history it appeared that most of the leading columnists were politically on the left. However, the paper was never the exclusive domain of leftists. Hosny wanted a diverse range of opinions to be aired in the paper, removing any risk of political gridlock. He had good reason to be proud of his record. A Little History of Egypt and U.S.
None of the Boston dialogues on the Arab-Israeli conflict, Palestine and other Middle Eastern issues could be considered complete without some discussion of Egypt. In fact, all the other dialogues, whether on the US, the global economic crisis and other international issues, somehow or other ended up touching upon developments and circumstances in Egypt. Egypt is not a superpower or even the key to stability in the Middle East. It is not the only country in the region the Americans are interested in. But the US, since its foundation, has always had some deep connection with Egypt that might elude many observers in both Cairo and Washington. Sceptics on this point need only to consider some major American symbols that link Egypt with the US and interweave their histories. The Washington Monument, within clear sight of both the White House and the Capitol Building, is constructed in the shape of a huge Pharaonic obelisk. The ancient Egyptian symbol betokens mankind’s quest to reach the skies, not literally but in the metaphorical sense of striving to attain the heights of moral perfection in accordance with the laws and principles God lay down for man. We find another connection between George Washington and ancient Egypt on the American one-dollar bill, which features his portrait on one side and, on the other, a partially completed pyramid over which hovers a guardian eye emanating rays of light like the sun. The pyramid, too, symbolises mankind’s upward pursuit, but the fact of its incompletion signifies that mankind’s civilisational mission has yet to reach its aims and that the American mission, therefore, is to follow through on what the ancient Egyptians began more five thousand years ago. This is not to suggest, of course, that America’s founding fathers believed in the rites and rituals of the ancient Pharaonic religion. But they were motivated by the sense of a civilisational mission that originated in Egypt, that was shaped in various ways by the divinely revealed religions, and that the US had the duty to complete through scientific attainment which extends its wisdom to all. Although ancient Greece is commonly regarded as the source of Western culture, it does not feature prominently in American national symbolism. Here Egyptian symbols, after which follow allusions to and actual imitations of Roman architecture, which hails back to that age of democratic traditions when the Senate was the real ruler of ancient Rome. The new Rome — Washington — traces its heritage and wisdom to the Egyptian and Roman empires. I personally felt this American admiration for Egypt and Egyptians in the 1970s when I was a student in the US and I was looking for a part-time job. The woman in the employment office went to considerable pains to help me find a job. It was around that time that president Anwar El-Sadat undertook his historic visit to Jerusalem. She shared the sense that no other leader in the world would have had the courage and confidence to take the initiative to visit the land of his enemies unless he were Egyptian, backed by thousands of years of civilisation to protect him and steer him in the right direction. During my present visit to the US, I advised my children to make no secret of their nationality. I knew that the name of Egypt was a kind of magical key that opened doors and won interest and kindness. Many Egyptians might find this hard to believe, but Egypt has consistently found a place in the results of Gallop polls on the Americans’ favourite countries. Generally, these include English speaking countries such as the UK, Canada and Australia, American allies such as Japan, France and Germany, and finally countries of a special character, such as Egypt, South Korea and Israel. Nor was Egypt’s standing in these polls shaken by the events of 11 September 2001, which precipitated a gulf between the US and the Arab and Islamic worlds. Not that there is a fanatical twist to the American infatuation with Egypt. It is not a case of the “Egyptomania” that is said to be common in France or of Masonic occultism that finds clues to the modern US in ancient Egyptian mysteries in the manner of Dan Brown’s The Lost Symbol and The Da Vinci Code. Rather, it is just that conversations about Egypt, especially when the interlocutors are academics who have not been overly soiled by tales of the Middle East and the Arab-Israeli conflict, acquire a totally different quality. Suddenly, your Brookings Institution researcher, Carnegie Institute colleague, founding member of the Council on Foreign Relations and other such academics, who pour out reams of impassioned and contentious articles and studies about Egypt, or otherwise they find it hard to publish or to secure spots on TV talk shows, become normal everyday people. Ordinary people and scholars at the same time have no interest in attacking the situation in Egypt. But many do have worries, doubts and sometimes questions about what is written in the press or what they are bombarded with across various media networks. At the time of the Boston dialogues, the London- based Economist came out with a special on recent economic, social and political developments in Egypt. This country survey, which featured a blend of criticism, praise and uncertainty, served as a kind of agenda for the discussion on Egypt in Boston. But what was striking in the discussion was that instead of merely reiterating published information, participants attempted to assess it from its point of origin, taking as their starting point the acknowledgment of the failure of the American project for the Middle East, which made such a muddle between strategy and historical imperative as to precipitate a state of impending chaos. Although the US had a legitimate reason for fighting the terrorism that destroyed the World Trade Centre in New York and struck the Pentagon in Washington, it needed an effective strategy, one that had a beginning and an end, identified means and methods, and clearly stated aims and objectives. What it came up with, instead, was a project to engineer history, the consequences of which we see today in Afghanistan where Kabul lost control over its territory, in Iraq where weak and ineffective elected political forces have been unable to form a government for months, in Lebanon where the cheers for the Cedar revolution ended with the surrender of effective power to a Hizbullah veto, in Somalia with its perpetual chaos, and in Palestine which has succumbed to a vicious division between those who seek to build and those who would rather launch missiles against their own people first and against their enemies second. How does Egypt fit into all this? Will it be able to keep its head in the midst of this growling and roaring bedlam? And against that backdrop why is the “succession question” the issue that most preoccupies the staff of political and strategic research centres, and the participants of political affairs conferences? In all events, the subject inevitably popped up and I took the occasion to observe that for over 200 years Egypt has never experienced a succession crisis, not even after the death of a leader of the stature of Gamal Abdel-Nasser, or after the assassination of another great leader, Sadat. This was not because there was a prince in line for a monarch’s throne or because there happened to be a vice-president in the wings. It was because there was always a clear preset rule for the rotation of the office of head of state. That rule stated the conditions a person had to meet and the procedures he had to follow if he thought himself eligible for high office and was prepared to engage in the political race as the nominee of a legitimate party or as an independent candidate, which may be more difficult but not impossible. After all, no one in any political system in the world has ever said that the road to the office of presidency should be easy, aside from the indolent and frivolous that expect things to be handed to them on a silver platter. In fact, it was in order to weed out such people that legislators put hurdles in the path of seekers of high office and required that the independent candidate either ally himself with others in the framework of a party or hit the road to persuade a broad array of representatives in parliament and governorate bodies that he is worthy of entering the race for the presidency. President Hosni Mubarak offered an example of what type of person should be considered worthy when he said that he would perform his duty to the country until the last beat of his heart. This spirit of dedication and commitment is “normal” for a person in his position. It is akin to the spirit of the soldier willing to sacrifice his life to defend his country. The Egyptian political system is not perfect, of course. It still has long strides to take and major reforms to implement in order to attain higher levels of progress and advancement. However, the question is whether our system can develop and evolve in accordance with Egyptian laws of evolution or whether we will have to go through the type of experiments we see every day in this neighbourhood, which, as we can see with our own eyes, are never as simple as their advocates claim and never as trouble-free as is purported by fascist groups who say they have the power to change a theocracy to a civil state. History informs us that democracies that arose through historical engineering had limited chances of survival, whereas success was guaranteed for democracies that were built upon the appropriate social, economic and cultural foundations. Meanwhile, it is universally granted that economic and social change in Egypt is moving full steam ahead. It is readily apparent in the features of the place and the movement of the people in this space. A token of change can be seen in the shift of the public focus from the distribution of wealth to the distribution of land. But land is valueless if left fallow and unexploited, which means that a commitment to the just distribution of land entails a concomitant commitment to the availability of fair opportunities to invest in and develop the land. As this realisation gradually took hold, it unleashed a race to transform the untapped land resources into areas bustling with life, vitality and enterprise. The drive reflected the growing awareness of Egypt’s great potential and the rise of a new competitive spirit in the quest to capitalise on this potential. So, Egyptians are definitely changing. But the ways used to gauge this change can sometimes be misleading. For example, it was long customary to compare Egypt and South Korea because their GDP were roughly the same at the outset of the 1960s, whereas today the South Korean GDP is ten times that of Egypt. That comparison would then be used to show how we failed and/or how our leaders failed to do their jobs. However, what was left unsaid was that the spread of education in South Korea in 1960 was 72 per cent whereas in Egypt it was only 25 per cent. Also, whereas Seoul at the time had resolved to become part of the developed West, Cairo continued to hover between different worlds whose only common denominator was misery. Imagine what South Korea would be like today if it had given the reunification of Korea precedence over progress or if it had resolved to keep its historical enmity with Japan alive instead of benefiting from the Japanese experience and Japanese investments. Today, in all events, the level of education in Egypt is equivalent to the level in South Korea in 1960 (and to the level in Europe at the outset of the 20th century). If this is rather depressing it simultaneously suggests that we now meet a major criterion for launching ourselves towards the creation of a robust industrial and economic base and sustainable democratisation. Which reminds us once again that it is not historical engineering that works to lift societies from one stage of progress to the next, but sewing and nurturing the seeds of knowledge and development. Many of my American interlocutors were shocked to learn that taxes were largely unfamiliar to Egyptians until quite recently. It was not until the last decade of the last century that we had a sales tax and not until this decade that we began to introduce realistic income and real estate taxes. Coming from a democratic society born from the motto, “No taxation without representation,” the Americans could readily understand why democratisation in Egypt has taken so long. As our Bostonian conversations shuttled here and there between diverse but interrelated subjects, they contributed other dimensions to the view of Egypt that were quite different from what one usually reads in the press or academic publications. Whatever might be said about those works, they lack that element of historical cohesion that puts the diverse bits and pieces about Egypt in proper perspective. At the same time, from my visit to Boston, as well as to Washington, Rome, Tokyo and other cities, I could not escape the conclusion that the image of Egypt abroad is not in the best of health. Grave doubts hang over its current condition and its future. Certainly, some of this comes from the propaganda of groups that do not wish us well. However, what they say should not bother us nearly as much as the concerns of those who do wish us well, who sincerely want to see Egypt progress and to see Egyptians live a better life, and who are baffled by the laws and conditions we insist on perpetuating regardless of how impractical, unrealistic and unaffordable they are. Conversations on Egypt are always long and intricate. But there is one question that will inevitably overshadow all others: Is another war looming in the Middle East? 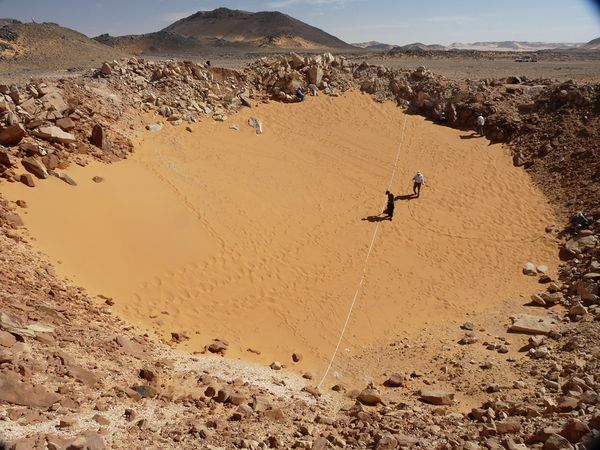 “Fresh” Crater Found in Egypt; Changes Impact Risk? “Fresh” Crater Found in Egypt; Changes Impact Risk?.